There are so many reasons why soccer players decide to attend a particular college. For some it is the closeness to home. For others it is the athletic and academic programs. And yet for other players it is the team and school environment itself. 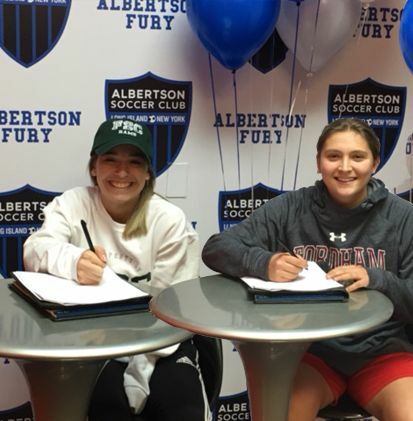 For Albertson Fury standouts Kayla Duvenhorst and Marissa Stanco, the colleges they selected to attend checked off many, if not all the boxes, on their respective lists. They were among 10 Fury players who announced their intentions on National Letter of Intent Day on Wednesday, Feb. 7. It certainly did not hurt that Farmingdale has a top-flight nursing program, in which Duvenhorst plans to major. Fordham University is a longer trip for Stanco, but its proximity fit the Glen Cove, N.Y. resident just fine. It’s about a 40-minute car ride to the Bronx college. In so many ways — on and off the field. That was an important part of the mix as well. Training with and playing for the Albertson Fury in some intense competition in the Elite Clubs National League helped prepare both players for college. The Albertson Fury’s success and its ability to place many players into top-flight college programs was not lost on club director of coaching Paul Riley. The club traditionally has participated in the highly competitive ECNL for many years, which has allowed Albertson players to showcase their talents to college coaches many times. All you need is one coach to believe in you, which can open the door to further opportunities. It’s not just showcasing your abilities. To play for the Albertson Fury in the ECNL, players must be committed and be ready to play and/or practice five times a week. Riley was referring to Farrell, who is an assistant women’s soccer coach at the University of Nebraska-Omaha.